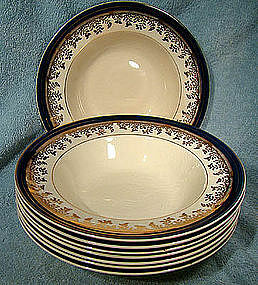 A group of eight 8" across rim soup bowls in the Myott Royalty pattern, in the cobalt blue colourway. 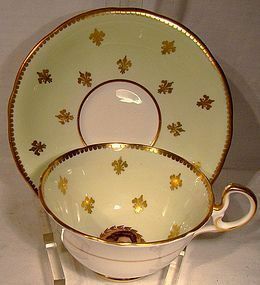 These blue and gold bowls are in excellent original condition with no chips, cracks, losses, damage or repairs other than some crazing on each bowl. All items are thoroughly and conservatively graded and all condition issues are noted; all items are vintage or antique and may have slight signs of gentle use. Surface shipping to the continental U.S. starts at $17 (other spots may vary) - insured is higher, and mandatory on items over $85 if paid with a credit card. Items paid with a credit card will be shipped to confirmed addresses only. We do ship internationally. All of our prices are in $US. NOTE: we DO NOT accept PayPal. A 1-1/8" diameter brass watch fob issued to commemorate Queen Victoria's diamond jubilee. 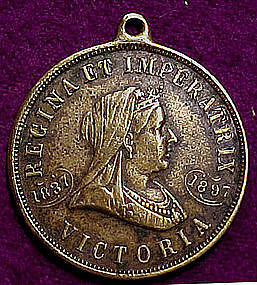 This fob could be worn as a pendant, and it has the legend 60th ANNIVERSARY OF THE CORONATION OF QUEEN VICTORIA CELEBRATED AT LONDON, JUNE 22, 1897 MADE IN AMERICA and REGINA ET IMPERATRIX 1837 1897 VICTORIA. This item is in very good original condition with no dents, bends, corrosion, losses, damage or repairs other than a pleasant patina from use and age. All items are thoroughly and conservatively graded and all condition issues are noted; all items are secondhand and may have slight signs of gentle use. Small packet shipping to the U.S. starts at $9 (other spots may vary) - insured is higher, and mandatory on items if paid with a credit card. Items paid with a credit card will be shipped to confirmed addresses only. We do ship internationally. All of our prices are in $US.